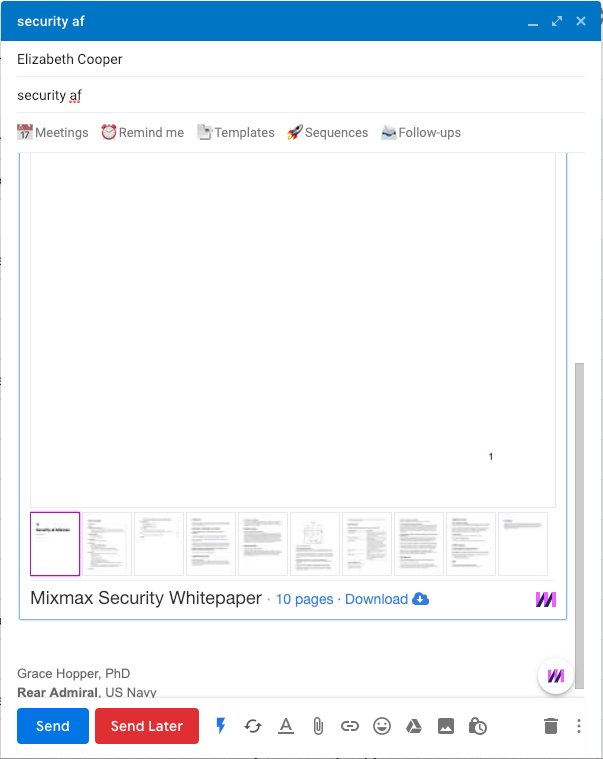 Mixmax offers a wonderful array of email enhancements. From group event polls, to link previews, to self-destructing emails - we’re your swiss army knife for your email! Within your compose window, hover over the “Enhance” menu in the lower left corner to see all enhancements grouped by function. With slash commands, you can quickly access the enhancement menu from within the compose window. After typing in “ / ” (slash - no quotes), you’ll see our full list of enhancements ordered alphabetically. Use the up/down arrows or your mouse to scroll through the list, and press “Enter” or click to select an enhancement. 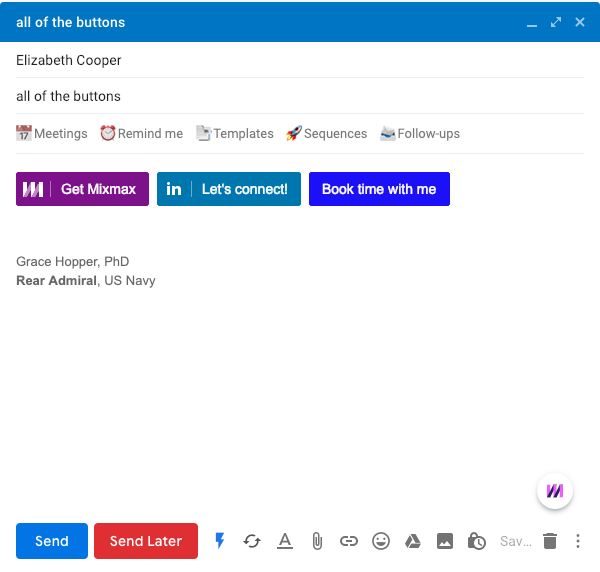 Just to the right of the “Compose” button within your inbox, click the drop-down arrow to start a new message using a few key enhancements. Calendars are our most popular enhancement category. 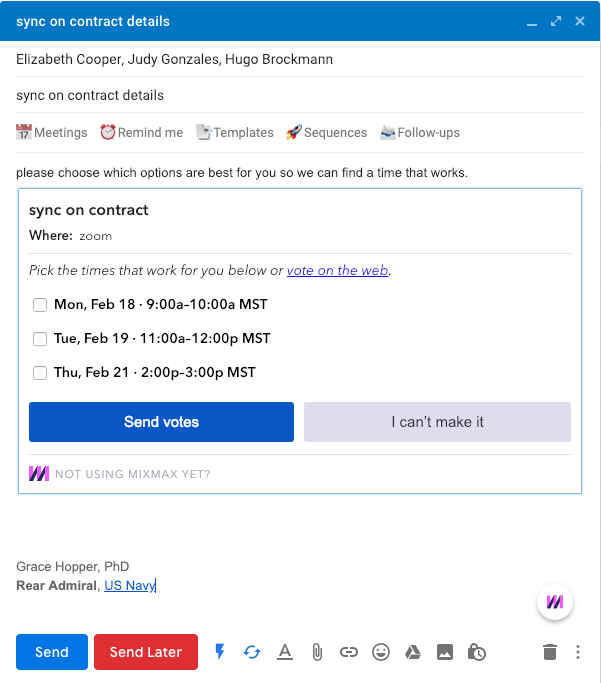 With calendar features, you can schedule group events or important meetings all within a single email! 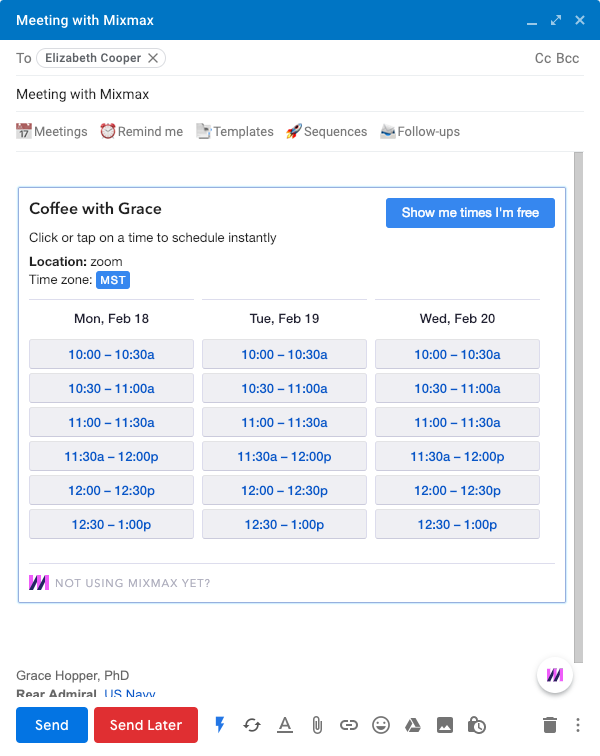 Share specific times that you’re available to meet, and your recipient can schedule instantly within your email! 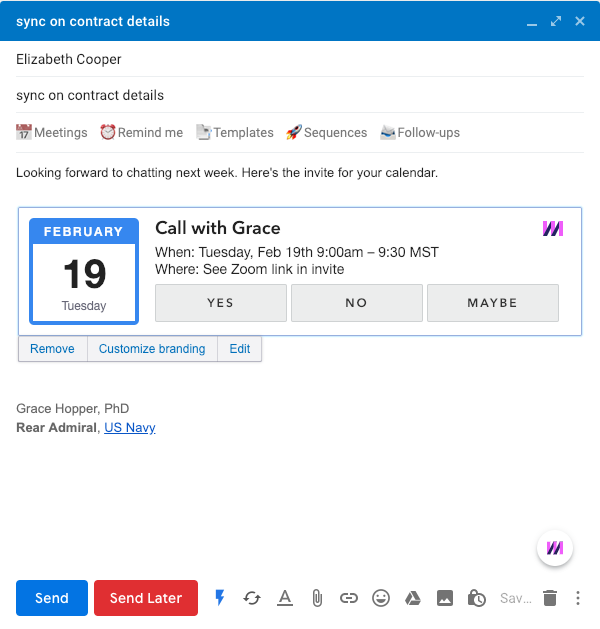 Insert a beautiful looking calendar invite directly into your email. 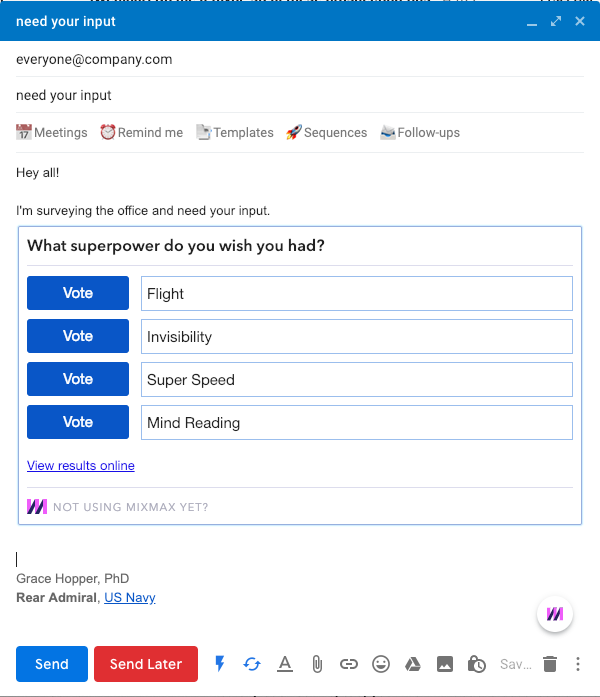 Quickly survey your recipients to find the best time to meet. Get a quick answer by inserting a yes or no question. 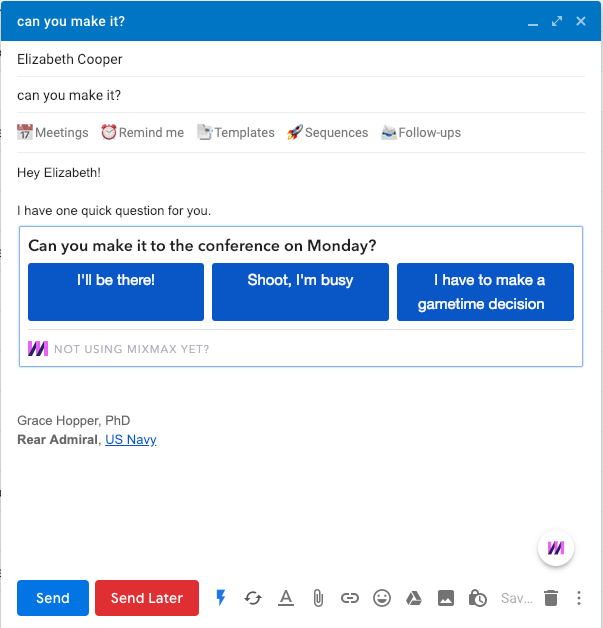 Customize the answer choices by clicking the button text and editing! 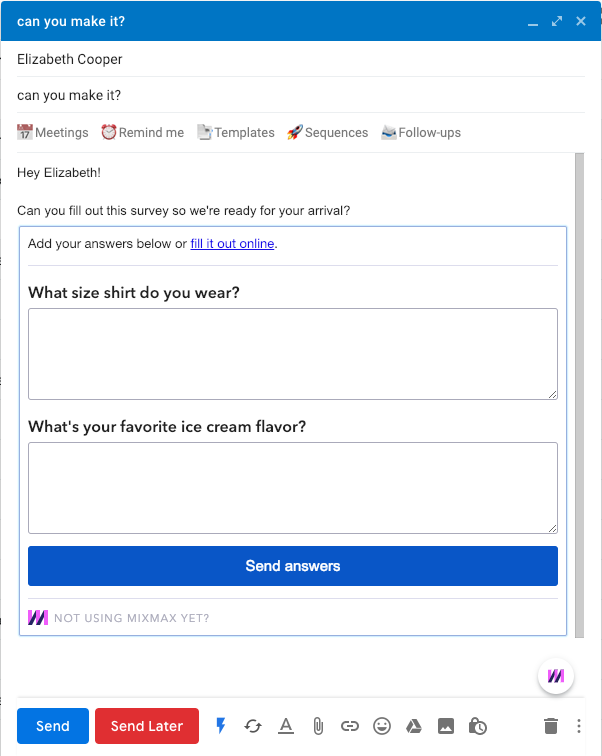 Ask an open-ended question by inserting a Q&A survey. Poll recipients by inserting a multiple-choice survey. Learn about poll results here. Upload an image from your computer. Or, type /image [search term] to find and insert an image from the web. 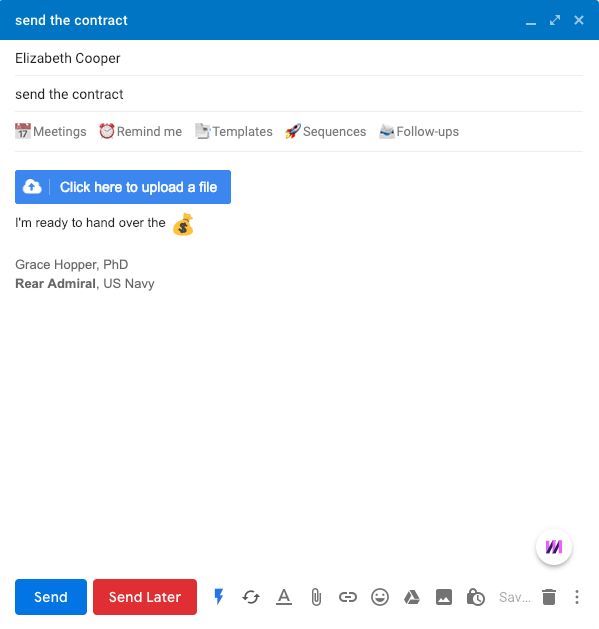 Attach a PDF into the body of your email. Learn how to enable PDFs here. Click the “Add Badge” button to place multiple social media badges next to each other horizontally. You can even use them to customize your signature. 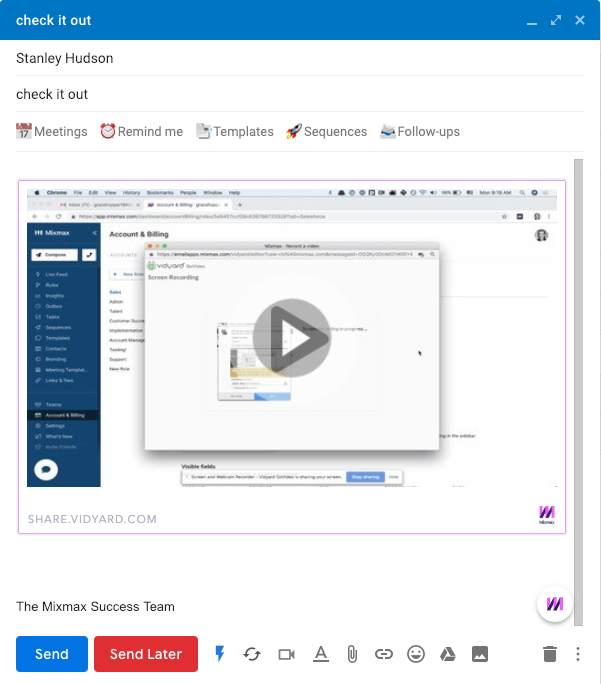 Search Yarn for videos to insert right in your email. Ask your recipient to upload a file by inserting this handy-dandy button. Search and insert a gif from Tenor (previously known as Riffsy). 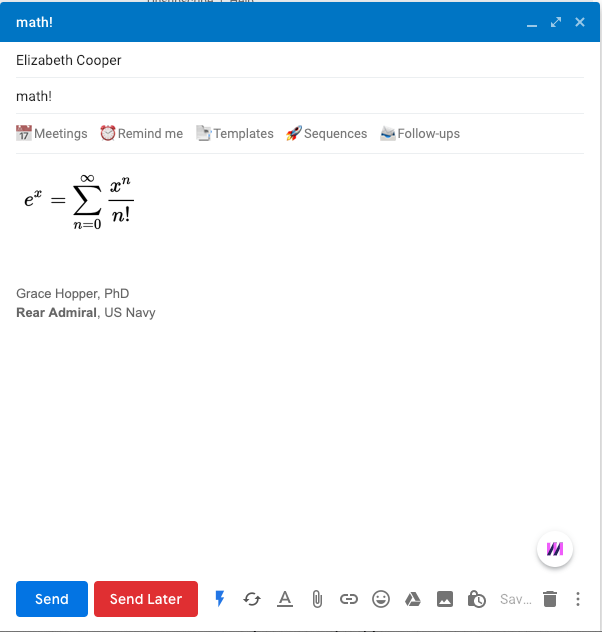 Turn clunky formulas into beautiful math for your emails! 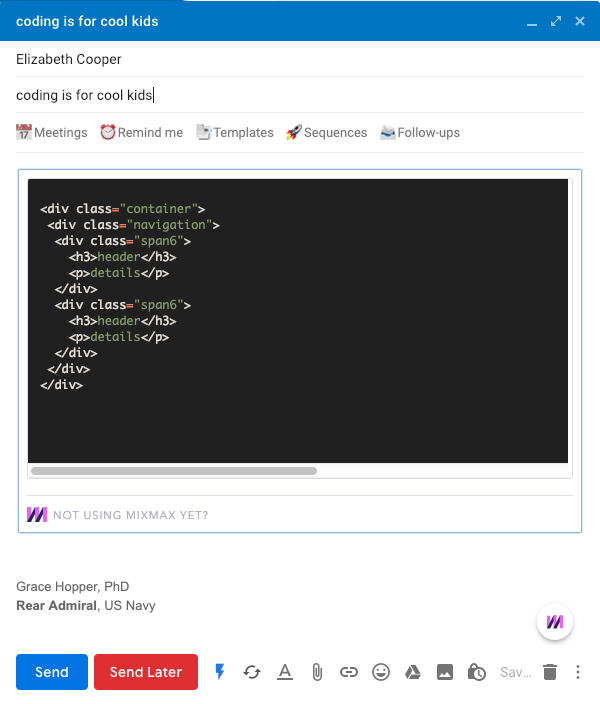 Choose from 31 color themes to share gorgeous formatted code - any language! Invite recipients to your live Crowdcast event. Great for webinars, Q&As, interviews, etc. Search and insert a gif from Giphy. 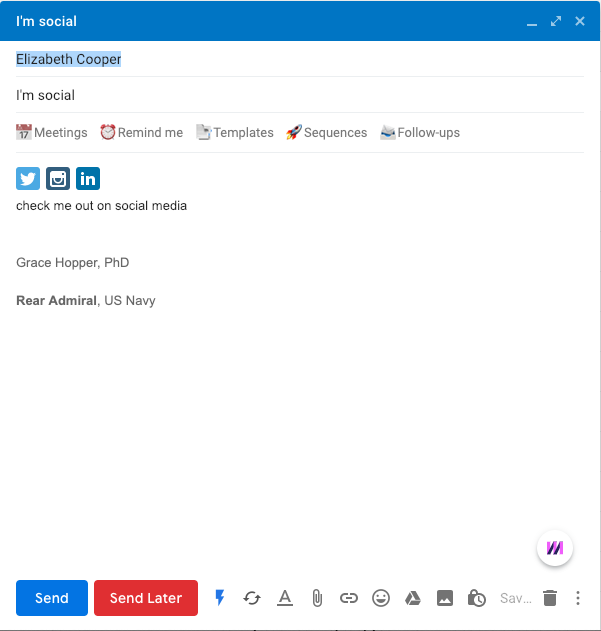 Inserts a simple grey line to separate sections, giving your emails a clean, professional look. Call to Action buttons encourage recipients to visit any site, even your Mixmax Public calendar, with one simple click. Write a secret message that recipients need a password to view. Have recipients send you an SMS directly via email, without knowing your phone number. Set your message to self-destruct at a specified time. Inserts a visual preview of your link, like below. Learn how to customize link previews here. Search or enter a YouTube video link preview. Video will also attach to your email. Insert a Vimeo video preview. Shows profile photo, name, title, current position, and location. Here’s what to do if you don’t see your LinkedIn preview. A hyperlinked map preview of any location. For Pinterest pins or boards. Shows the full tweet without recipients needing to visit Twitter. Enter a Twitter handle to insert a live Twitter timeline, specifying number of tweets. Capture part of a live website and embed web content in your email. 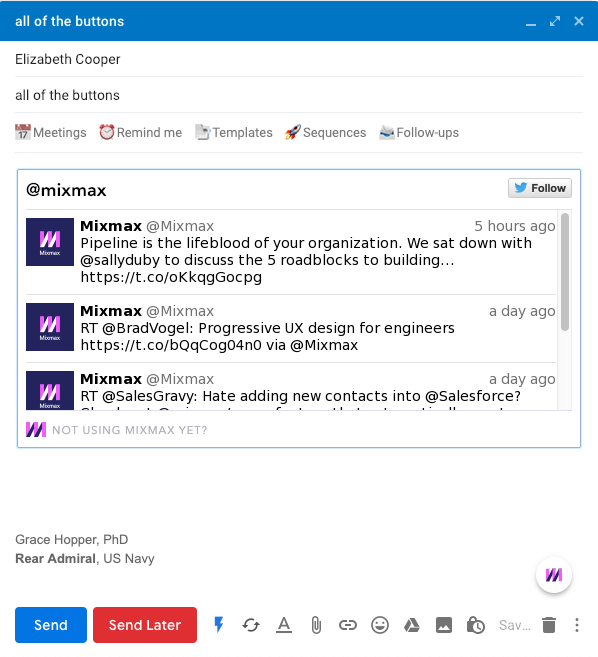 Share your love for Mixmax!